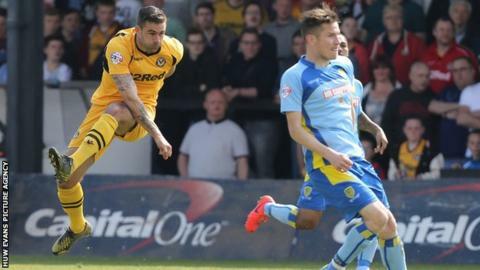 Burton Albion's hopes of automatic promotion suffered a blow following a 1-1 draw at 15th-placed Newport. Andy Sandell gave the Exiles an early lead at Rodney Parade, blasting home a powerful shot from outside the area. Michael Symes equalised for the Brewers from the penalty spot after Dominic Knowles was fouled by County defender Darcy Blake. Burton, who are fifth, are now six points behind third-placed Rochdale with two games to go. Both sides pushed for a winner after the break and Alex MacDonald hit the post for Burton with a long-range effort. Albion goalkeeper Dean Lyness denied Sandell a second deep into injury time, keeping out his close-range header. "We saw it at half-time and the referee didn't have a good view of it. "I thought he made a big decision and it was a costly decision on our behalf." "Reaching the play-offs is a really good achievement. It was always going to be difficult to do that, particularly at the start of the season after losing the players we did. "After a very, very poor start, it took us ten minutes or so to get going and we found ourselves one-nil down within that ten minutes. We got back into the game and we settled down a little bit. They started the second half a little bit brighter, but in the last twenty-five minutes we got into some really good positions. "Unfortunately, we weren't able to nick the win, which I think would have been a little unfair on Newport too, because they're a tough, physical side and I thought that was a really committed performance from them." Corner, Burton Albion. Conceded by Darcy Blake. David Gray (Burton Albion) wins a free kick on the right wing. Attempt saved. Andy Sandell (Newport County) header from the right side of the six yard box is saved in the top centre of the goal. Corner, Newport County. Conceded by David Gray. Max Porter (Newport County) wins a free kick in the attacking half. Attempt saved. Shaun Jeffers (Newport County) header from very close range is saved in the top centre of the goal. Attempt missed. Alexander MacDonald (Burton Albion) right footed shot from outside the box misses to the left. Attempt saved. Robbie Willmott (Newport County) right footed shot from outside the box is saved in the top centre of the goal. Attempt missed. Marcus Holness (Burton Albion) header from the centre of the box misses to the right. Substitution, Burton Albion. Billy Kee replaces Michael Symes. Attempt missed. Matthew Palmer (Burton Albion) right footed shot from outside the box is too high. Substitution, Newport County. Shaun Jeffers replaces Lee Minshull. Hand ball by Alexander MacDonald (Burton Albion). Attempt saved. Marcus Harness (Burton Albion) left footed shot from the right side of the box is saved in the centre of the goal. Alexander MacDonald (Burton Albion) hits the right post with a right footed shot from outside the box. Substitution, Burton Albion. Marcus Harness replaces Dominic Knowles. Attempt blocked. Aaron O'Connor (Newport County) right footed shot from outside the box is blocked. Substitution, Newport County. Adam Chapman replaces Christian Jolley. Substitution, Burton Albion. Alexander MacDonald replaces Ashley Hemmings. Substitution, Newport County. Aaron O'Connor replaces Michael Flynn. Attempt missed. Chris Zebroski (Newport County) header from the centre of the box misses to the right. Corner, Newport County. Conceded by Dean Lyness.